Richard Suen won legal cases on the same issue in 2008 and 2013, but the Nevada Supreme Court overturned both of those decisions. 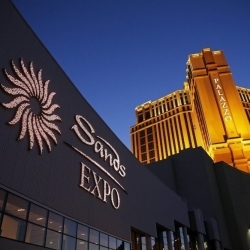 Las Vegas Sands Corporation notified the Securities and Exchange Commission (SEC) in a filing that the casino company settled its breach-of-contract lawsuit with Richard Suen. The filing with the SEC did not disclose terms of the deal. The notice, which was filed Wednesday with the SEC, said that Richard Suen’s company, Round Square Co., had “released all claims” against Sands. The two sides announced an agreement had been reached on March 14. The settlement came a little more than two weeks after LVS founder and chief executive Sheldon Adelson was unable to appear in court to testify, due to health concerns. The case had been ongoing in a Nevada state court, but needs approval from the federal regulator before it is final. When filed with the state court, the settlement’s terms were confidential. Sands spokesman Ron Reese declined comment on the case. John O’Mally, an attorney for Richard Suen, also declined to comment when Nevada newspapers asked for remarks. Thus ends a 15-year saga which saw Las Vegas Sands twice lose in Nevada state court, but have the judgment nullified by the Nevada Supreme Court. Richard Suen is a Hong Kong businessman who worked on behalf of Las Vegas Sands in the early days of its Macau casino development. Las Vegas Sands Corp was a second-tier casino operator on the Vegas Strip as late as the 1990s, but its investment in the Macau gambling industry transformed LVS into the single-largest casino company in the world. After Macau reverted from Portuguese to Chinese governance in 1999, the Beijing government granted the former colony special autonomy and allowed its gambling industry to continue. SJM Holdings’ 40-year old monopoly was ended in 2001 and Macua offered licenses to a handful of Chinese and American companies. SJM Holdings (Stanley Ho), Galaxy Entertainment Group (Lui Che Woo), and Melco Resorts (Lawrence Ho) were the three Chinese license holders, while Las Vegas Sands, MGM Resorts, and Wynn Resorts became the three American licensees. By 2004, Sheldon Adelson’s Las Vegas Sands was developing the Venetian Macau, a history-making mega-resort which would become the most successful casino in the biggest casino destination city in the world. From 2004 to 2013, Macau went from a provincial backwater to generating 7 times the gaming revenue of Las Vegas, the number two casino destination spot. Venetian Macau set the standard for what Chinese gamblers wanted in an integrated casino-resort. In his lawsuit, Richard Suen claimed he was instrumental in Las Vegas Sands receiving its gaming license for Venetian Macau. In 2004, he sued LVS for $5 million and 2% of the Sands China Ltd’s future profits in Macau — which would have been a tremendous sum. In 2008, Suen won his lawsuit against LVS in a Nevada district court and was awarded $59 million. Las Vegas Sands appealed the decision and the Nevada Supreme Court overturned the decision on appeal. The reversal did not deter Richard Suen. He filed a second lawsuit and in 2013 won the case, this time receiving $70 million in damages and $31 million in interest, due to the 9 years the cases had been in court. The Nevada Supreme Court once again overturned the decision on appeal, claiming Richard Suen did not have the evidence to support his claims against Las Vegas Sands Corp.
Richard Suen’s lawyers filed a third lawsuit in 2016, which ended up in the court of Nevada District Court Judge Rob Bare. That case is the one which was dismissed after the settlement on March 14. Sheldon Adelson’s poor health might have played a hand in the settlement. Recently, Mr. Adelson was supposed to appear in Judge Bare’s court to give testimony in the case. James Jimmerson, Adelson’s lawyer, told the judge his client could not give testimony due to his battle with non-Hogskin’s Lymphona. Without the testimony of a key witness, the defense might have decided it was better to settle the case. Or it might be, after 15 years of legal battles, it made sense for Las Vegas Sands to pay Richard Suen to go away. Sheldon Adelson is estimated to be worth $34 billion, so paying a settlement estimated to be in the tens of millions might be a better option than more years of litigation.